5:10 AM high 5.5 ft.
12:21 PM low 0.4 ft.
7:36 PM high 4.8 ft.
How to reach: To reach the tidal bench marks from the U.S. Highway 101 in North Eureka, take Samoa exit from State Highway 255, and proceed NW on State Highway 255 for 2.9 km (1.8 mi) to a T intersection, then turn south onto the Navy Base road and continue for about 6 km (4 mi) to Humboldt Bay Coast Guard Station. The bench marks are on the Coast Guard Base property. 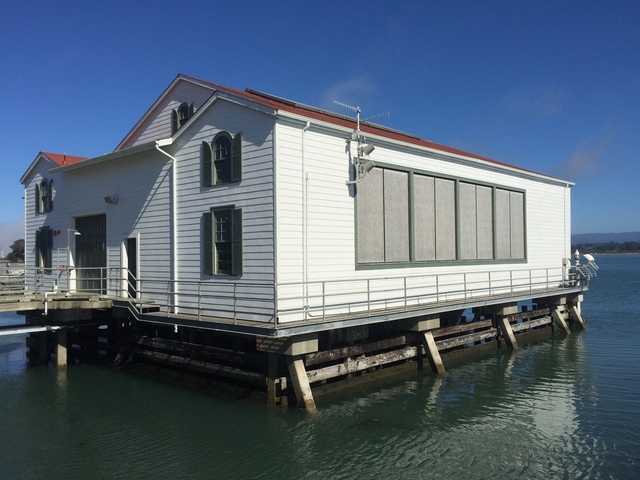 The tide gauge is at the east end of the southern pier of two finger piers directly east of the 3-story Coast Guard station building.